A novel in stories set in the small town of Crosby, Maine, Olive Kitteridge is a peek inside the lives and minds of various residents. Olive appears somewhere in every story, but not always as a main character. We also meet her steadfast husband, a former student of Olive’s who is considering suicide, a local piano player trying to get over a futureless romance, a jilted young bride-to-be, and many other intriguing characters. Olive is a creature of habit, with very particular expectations of other people, which they don’t usually live up to. She has very strong opinions and no qualms about sharing them. (Her views on George W. Bush are especially hilarious.) I very much enjoyed reading about her and found her sympathetic, but she is not someone I would want to actually spend time with. Still, she is fascinatingly real and complicated and you can see how easy it would be to become such a person. My mother is around the same age as Olive, also a retired teacher (who also had no love for George W. Bush) but with a very different outlook, and I can’t help thinking about how things could have been different for Olive. She is unapologetic and stubborn, which has cost her a lot – she is emotionally distant and pushes people away - and she seems, through most of the book, not to recognize how she has made her life into what it is. It’s not a terrible life, but not especially fulfilling. I couldn’t get enough of this town and its inhabitants. Strout has such a talent for creating compelling characters that each one could have been the center of his or her own novel, and I would have been happy to read all of those novels. Such a perfect little book! Thanks for this review. I have almost bought "Olive Kitteridge" on every visit to the bookstore. Currently reading Lorrie Moore's "A Gate at the Stairs." 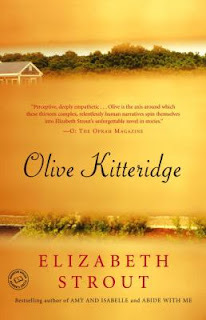 I bought Olive Kitteridge for my mom for Christmas, I think she will love it! Also, you should read Amy & Isabelle, Strout does an amazing job of character and place in that novel as well, it has stuck with me for many many years.